Wind, solar, biomass and waste-to-energy, geothermal, small hydro and marine sources of power added 138.5 gigawatts to global power capacity in 2016, up eight percent from the year before. The added generating capacity roughly equals that of the world’s 16 largest existing power producing facilities combined, according to the report issued Thursday by three institutions – UN Environment, the Frankfurt School-UNEP Collaborating Centre, and Bloomberg New Energy Finance, BNEF. “It’s a whole new world: even though investment is down, annual installations are still up,” said Michael Liebreich, chairman of the BNEF Advisory Board. Investment levels in renewables fell in 2016. Less investment was needed due to falling costs. The report shows that the average dollar capital expenditure per megawatt for solar photovoltaics and wind dropped by more than 10 percent compared to the previous year. “Ever-cheaper clean tech provides a real opportunity for investors to get more for less,” said Erik Solheim, executive director of UN Environment, the United Nations environment agency based in Nairobi, Kenya. “This is exactly the kind of situation, where the needs of profit and people meet, that will drive the shift to a better world for all,” Solheim said. Investment in renewables capacity was roughly double that in fossil fuel generation, the report shows. The new generating capacity from renewables was equivalent to 55 percent of all new power brought online in 2016, the highest proportion to date. “The investor hunger for existing wind and solar farms is a strong signal for the world to move to renewables,” said Professor Dr. Udo Steffens, president of Frankfurt School of Finance & Management, commenting on record acquisition activity in the clean power sector, which rose 17 percent to US$110.2 billion last year. The proportion of the world’s electricity coming from renewables, excluding large hydro, rose from 10.3 percent to 11.3 percent. The report indicates that this prevented the emission of an estimated 1.7 gigatonnes of carbon dioxide. Recent figures from the International Energy Agency cited the switch to renewables as one of the main reasons for greenhouse gas emissions staying flat in 2016, for the third year running, while output in the global economy rose by 3.1 percent. The total investment in renewables last year was $241.6 billion, the lowest since 2013, due in large part to falling costs. 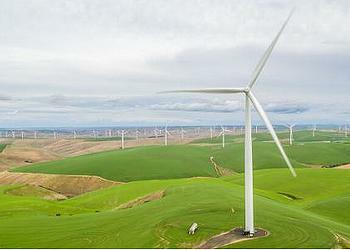 Purchases of assets such as wind farms and solar parks reached a new high, $72.7 billion. The average dollar capital expenditure per megawatt for solar photovoltaics and wind dropped by over 10 percent. Solar capacity additions rose last year, while wind capacity additions fell. New investment in solar totalled $113.7 billion, down 34 percent from the record high in 2015. Even so, solar capacity additions in 2016 rose to an all-time high of 75 gigawatts. 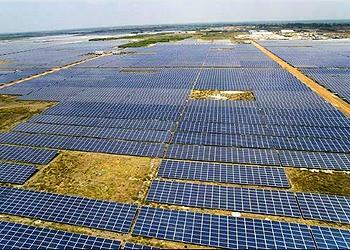 The Ramanathapuram solar complex in India’s Tamil Nadu state, the world’s largest solar photovoltaic project at 648 megawatts, was constructed and came online in September. “A plant of this magnitude reinstates the country’s ambitions of becoming one of the leading green energy producers in the world,” said Gautam Adani, chairman of the Adani Group, which built the solar complex. Wind made up $112.5 billion of investment globally, down nine percent; wind capacity additions fell to 54 gigawatts from the previous year’s high of 63 gigawatts. While much of the drop in financing was due to reduced technology costs, the report documented a slowdown in China, Japan and some emerging markets, for a variety of reasons. China saw investment drop 32 percent to $78.3 billion, breaking an 11-year rising trend. Mexico, Chile, Uruguay, South Africa and Morocco all saw falls of 60 percent or more, due to slower than expected growth in electricity demand, and delays to auctions and financings. Japan slumped 56 percent to $14.4 billion. Jordan was one of the few new markets to buck the trend; investment there rising 148 percent to $1.2 billion. The United States saw commitments slip 10 percent to $46.4 billion, as developers took their time to build out projects to benefit from the five-year extension of the tax credit system. “The question always used to be ‘will renewables ever be grid competitive? '” said Michael Liebreich, chairman of the Advisory Board at BNEF. Investment in renewables did not drop across the board. Europe enjoyed a three percent increase to $59.8 billion, led by the UK ($24 billion) and Germany ($13.2 billion). Offshore wind ($25.9 billion) dominated Europe’s investment, up 53 percent due to mega-arrays such as the 1.2 gigawatt Hornsea project in the North Sea, estimated to cost $5.7 billion. 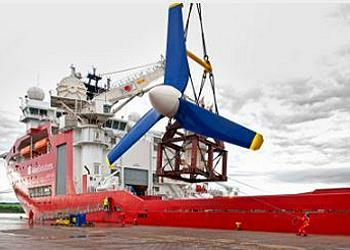 The launch of the world’s first large-scale tidal energy farm in Scotland in September was hailed as a significant moment for the renewable energy sector. A turbine for the MeyGen tidal stream project in the Pentland Firth was unveiled outside Inverness in the Scottish Highlands. China also invested $4.1 billion in offshore wind, its highest figure to date. Another positive sign came in winning bids for solar and wind in auctions around the world, at tariffs that would have seemed inconceivably low a few years ago. The records set last year were $29.10 per megawatt hour for solar in Chile and $30 per megawatt hour for onshore wind in Morocco.